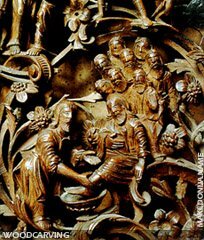 The woodcarving tradition in Macedonia exist for several centuries. 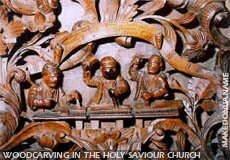 The number of the master pieces is high and they are prove for the flourishing woodcarving tradition, for which Macedonia is well-recognized. The arts are mostly of unknown authors, but with high capabilities and extreme values. Among the famous, which represent real master pieces, are the Iconostasis in the St. Spas church in Skopje and the St. Jovan Bigorski monastery, near Debar. All of them were made by the successful maestros, Petar Filipovski - Garkata, his brother Marko and Makarie Frčkovski (who lived in the 19th century), all of them from the Gari village (Miyak district), in western Macedonia. The iconostasis in the church St. Spas in Skopje, was made in the period 1819-1824 and represents one of the most known arts, at all. With it's dimensions height and width of 10 meters, it is not the biggest iconostasis in Macedonia, but the most valuable, because of it's techniques, composition, the wealthy provided by the flora and fauna ornaments and the several geometrical shapes. The woodcarvers illustrated on it, the Holy letter. The composition "Gozba kaj tzar Irod" shows Salome in the local Galičnik (Miyačka) dress. While the second master piece is in the Saint Jovan Bigorski monastery, and was built in the period of 1830-1835. It is larger and bigger than the one in the Holy Saviour church in Skopje. It is the largest woodcarving in Macedonia. This one is also a master piece of the same woodcarvers group, lead by Petar Filipovski - Garkata.